The UsuryFree Eye Opener: Introducing "Economics 102"
Art Powell's blog "Economics 102" applies basic economics to real problems. There are many relevant articles at "Economics 102." 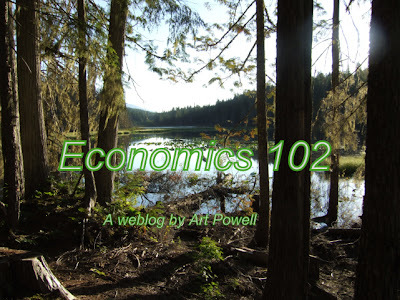 "A 4000-word essay titled “LETS go to market: Dealing with the economic crisis“ has been added as a page to this web log. Some of the ideas in this essay have not (yet) been presented in the web log. The ideas in this article are outside mainstream economic analysis but I believed they are mostly based on the economics I learned as a student at the University of British Columbia. We look at the formula from the quantity theory of money which I prefer to call the connectivity formula because it shows how the real part of the economy connects with the financial. There have been many ups and downs in the Q part of this formula. These changes have impacted previous economic crisis. The underlying cause of the current crisis is probably the unsustainable use of resources. Such a radical change in our financial organization would be an opportune time to make other changes on our economic organization. I would like to see the perfect competition model used as a guideline. NOTE: In the essay, Art Powell has included much relevant information about "LETS" (Local Exchange Trading System) and "NETS" (National Exchange Trading System) - worthy of reading and bookmarking for future reference.